After a successful re-invigoration of the QIA and the continuing efforts to obtain suitable premises on a permanent basis for the Association, we have reached the time when nominations for the Board of Directors has arrived, and the Annual General Meeting is set down for Wednesday 21st November 2018 at 6:30pm at West Bulldogs Rugby Club. 30.1 Nominations of members eligible to fill the several positions comprising the Board shall be in writing signed by the nominee and by two Financial National Members, as proposer and seconder, and shall be posted to the post office box nominated by the Returning Officer to be received no later than the hour of 4pm thirty-five (35) before the date of the Annual General Meeting in any year. 30.2 All such nominations shall be immediately reported to the Chairman, and shall be forwith published on the website of the Association upon the expiration of such time for nomination. Nominations for election to the Board are now open. Nominees must be National members and must have been a National Members as at 30 June 2018. “ (1) The Board of Directors consisting of a President, a Vice president, a Treasurer and six other Members all of whom except as otherwise provided in this constitution shall be elected annually as provided for under clause 32. (2) The Board of Directors shall elect the President to be the Chairman and the Vice President to be the Vice Chairman of the Association. A director’s kit setting out details of the nomination and the election process may be obtained by contacting the Secretary at enquiries@queenslandirish.com. Dr Rodney Sullivan and Robyn Sullivan have been appointed Honorary Historians of the Queensland Irish Association. They have contributed many articles and presentations about the Queensland Irish Association and more generally concerning the history and memorials of people of Irish descent in Queensland. 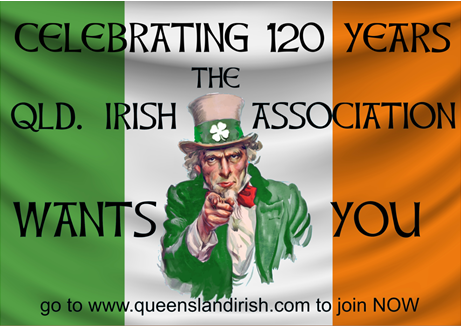 The Board has asked them to write a History of the Queensland Irish Association, to be published in time for the 125th Anniversary of the founding of the QIA 0n 28th March 2023. A paper by Rodney Sullivan “The Queensland Irish Association: Origins and Consolidation, 1898-1908” appeared in the Queensland History Journal Vol 22 No 5 May 2014 at pp401-415. It is available by clicking: [The Queensland Irish Association: Origins and Consolidation, 1898-1908]. Membership cards have been produced and sent to members. If you have paid your membership and not received your card, please contact enquiries@queenslandirish.com. All dinners are held at Hotel Pacific Brisbane 345 Wickham Terrace Spring Hill. For bookings please contact Tony Pisani – Email : fartacus8@gmail.com or phone : 0468 969 148. The Tigh Gaelach Dining Club celebrate a long history of enjoying good food, wine, and wonderful company. Our inaugural dinner was held in June 1987 and was organised by very active female members of the Queensland Irish Association. We meet at 7:00 pm on the last Wednesday of the month between February and November at Mick O’Malleys Irish Pub, 171-209 Queen Street, Brisbane. Our ladies enjoy pre-dinner champagne, an interesting and varied two course meal with wine, beer or soft drink throughout. We have monthly raffles with great prizes. Dinners cost $45 and membership is $5 per year. Any bookings need to be made by Wednesday the week prior to our dinner. When booking, please provide all names of those attending, a contact number and any specific dietary requirements. We have a great committee who help support our members and they all work hard to make our evenings fun. We’d love you to join us. This is the preferred method of payment as the QIA is not charged any fee by the bank. Thank you for your continuing support of the Queensland Irish Association. We look forward to seeing you at future events.